There is a saying that ‘life is a journey and only you hold the key’ and for Cheryl Greaves, that holds true as her life has taken many paths. At 60, and with over 40-plus years driving experience, Greaves has explored much of this beautiful nation from behind the steering wheel. At the age of 18 she began her first job at a bank a salary of $2000 which she relays was considered a lot of money back then for someone her age to earn. However, this career was not her calling and she quickly left that job after the first month to follow her heart. Greaves said during her sojourns as a commercial trader she often travelled to Suriname. Like the wind, she worked in and out of Georgetown simply going with the flow of endless possibilities, be it managing her trade business or getting behind anything with wheels. About six-years ago she bought a vehicle and quickly began working in the taxi services. 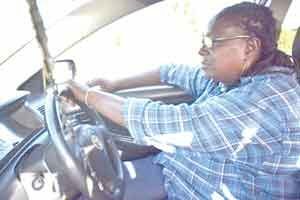 The experienced driver and mother of one currently works for Green Ice Taxi Service and noted that persons must love their jobs to perform well. Despite the irregular hours attached to this profession and the fact that it “keeps her on her toes,” Greaves said it is an avenue to learning something new every day. “You see with driving you get to interact with different people who would discuss different things. I mean you learn something new each day… Sometimes as the driver, you might have problem and you pick up a passenger that you can talk with or vice versa; where a passenger might have a problem and you might be able to give them advice,” Greaves said. Labeling herself as a ‘go-getter’ Greaves acknowledges that there have been ups and downs in life. However, her ability to push forward and surpass the challenges has helped her achieve her goals. Her mantra is “keep your head above water and keep swimming to win” and shares this refrain often with young people, particularly young women.